I wish everyone a happy spring! The past 16 months as SITC President have been eventful, and I am especially focused on a topic important to me: the role of women in our field. SITC 2018, scheduled for Nov. 7 – 11 in Washington, D.C., will be my second and final Annual Meeting as President before turning the role over to Mario Sznol's, MD, capable hands. The recent advances we've seen in our field are truly impressive. I look forward to the data presented at this year's Annual Meeting that highlight that progress. 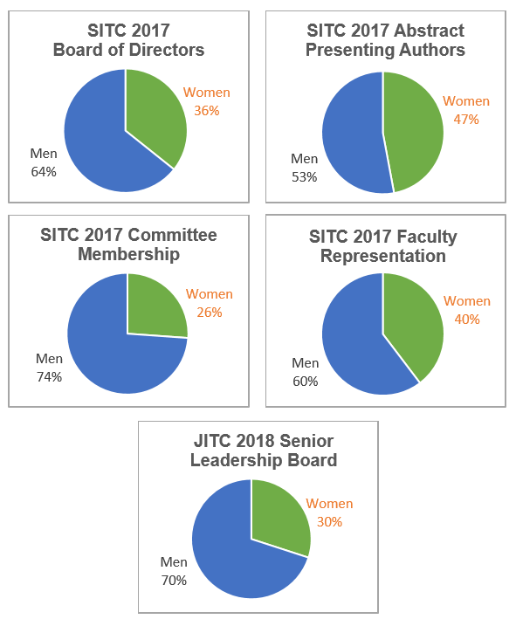 SITC hasn't previously tracked gender data from members or meeting participants, so these figures are an important baseline by which we can measure our future progress. This information will help us identify gender gaps within our volunteer roles and program numbers, with a societal goal of reducing any gaps and providing equivalent opportunities in the future. 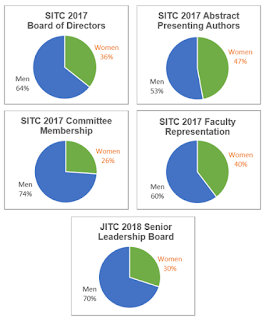 There are many women within SITC contributing in various leadership capacities – serving on the Board of Directors, as Section Editors in the Journal for ImmunoTherapy of Cancer (JITC), as meeting organizers, and through participation on our committees. These women play a critical role in the future of SITC, and I am confident our female contingencies in both membership and participation numbers will grow. I am proud to have helped develop our first "Women in Cancer Immunotherapy" reception at the 2017 Annual Meeting. More than 30 of my female colleagues joined me to discuss ways we can bring sharper focus to women's contributions in the field, ensuring there is balance between the genders in speaking and leadership roles. Interestingly, I find myself a member of two other similar groups. At my own institution, the UPMC Hillman Cancer Center has convened a Women's Task Force to address any gender issues among the female faculty. I am also pleased to participate in the BMS-led "Women in Oncology and Research" group that includes representation across many societies and institutions. Clearly, there is terrific energy and momentum for addressing the professional experiences of women in many areas. I look forward to hosting a second reception during the 33rd Annual Meeting & Pre-Conference Programs, this November at the Walter E. Washington Convention Center in Washington, D.C., our new venue. Please stay tuned for the scheduled date and time. Speaking of the Annual Meeting, this issue of the Immune Monitor is dedicated to our upcoming annual conference. 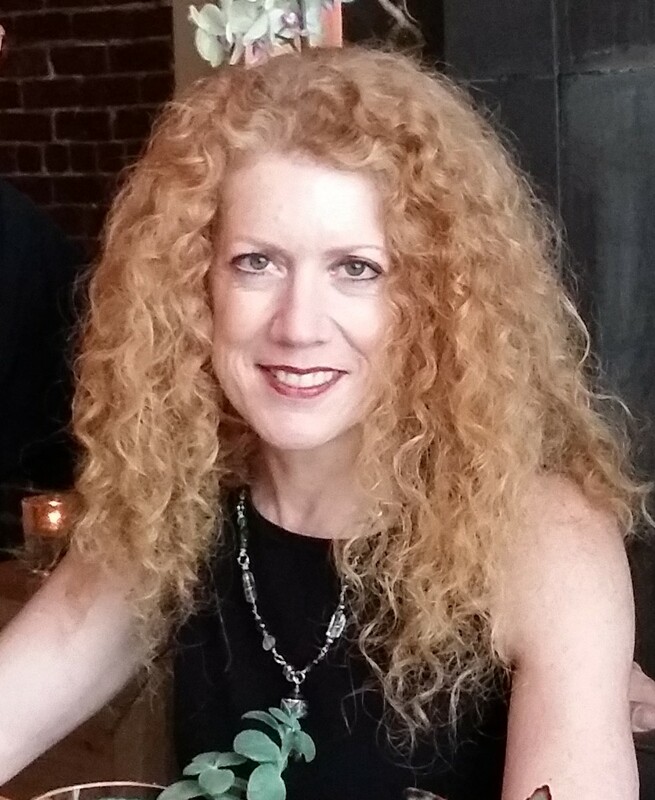 Please read on to learn more about new offerings and recurrent meeting highlights. SITC 2018 registration, available to SITC members at a discounted rate, is now open to the general public. SITC 2018 promises to be our society's best yet and I look forward to seeing the SITC family in Washington, D.C.!